Betting on Half of the Wheel(18 Numbers). I have one thought on this betting strategy. First you do not know where the ball is going to land for certain. (18 numbers, a 1/2 wheel bet) this makes it harder to work out where the ball will go or will not go, I think in the long run it would be to hard to predict. There are 4 parts of the wheel 2 parts have 9 numbers. 2 parts share the Zero & have 10 numbers on a single Zero wheel. 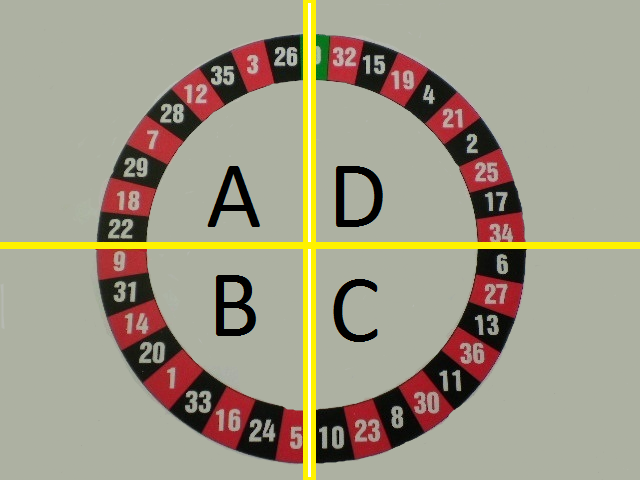 Divide the wheel into 4 parts, & you have 6, lots of 18 numbers. Except if your Sections, includes ("A" & "D") then add the (Zero).